With the right designs, you can transform your backyard into a private retreat. It can be as simple as a quiet sitting area to unwind peacefully in the fresh air after a long day cooped up in the busy office. Or maybe you want to vacation in your own back yard by creating a complete outdoor living oasis with everything you would need for hours of outdoor activity. Start by considering the needs and desires of your family to determine the right design approach for your personal retreat. Do you need a comprehensive plan that accommodates the kids and their friends as well as an entertaining space for the adults? Or is it going to be more of a private retreat for you and your spouse. Since everyone tends to congregate in the kitchen, when the weather is nice why not take that experience outside to enjoy the fresh air and scenic views. Add an outdoor dining space and you are ready for an entire evening of outdoor entertaining or just relaxing with family. Does this sound like a dream come true to you? If so, it’s time to call ProGreen and get your project started. Introducing fire into your outdoor living space creates a destination and gathering spot. Whether for heating or shedding light into the dark of night, the attraction of fire is undeniable. Fire features for the landscape come in a variety of forms and price points from the simple fire pit to the elaborate stone fireplace. In recent years, designers and manufacturers have developed elegant and unique lines of stand alone fire elements with the benefit that the homeowner can move the fire feature when wanted in other areas. 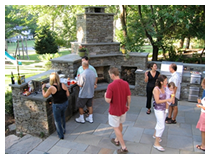 On the other hand, the permanent masonry built fireplaces provide an anchor in the landscape around which an outdoor living space can be developed. Your, needs, desires and budget will determine the right fire feature for your landscape. class — not to mention value — to properties big or small. The gurgling sound of a bubbling fountain, the organic character of a naturalistic pond or the recreation and relaxation of a swimming pool can become part of your backyard retreat. If you are considering a stand-alone fountain, you will find a vast range from old world European to modern contemporary style to fit your preferences. These items can become a sculptural accent in any backyard retreat. Or maybe you prefer a naturalistic pond with waterfalls reminiscent of a country creek with fish and water plantings of all sorts. Contact us today and let us know how we can turn your backyard into your oasis.